BAHAHAHAHAHAHAH, "maybe someone will have a wound". I'm dying. Also, isn't it just like a man to remember the most random, minuscule detail and then completely miss something obvious or big??!? I not only can see him going to the neighbors to ask about the lights, I can see him being their new best friend and getting referrals from them. Ok these are a riot and so darn unique. Oh. My. Goodness. This is absolutely pure gold! Love that he was gonna go to the neighbor's house (did he??) and the Clark Griswold comment was amazing. And the OB tampons...well, all of it. Thank you for this amazing laugh today! LOL... Maybe Clark should take the OBs as a wound gift for the neighbors...! OB's are great for nosebleeds! Did he ever find out where your neighbors got the "perfect" lights? LOL at the tampons, and MFD is a better man than my husband will ever be to even dream of putting a tampon in his mouth... my husband acts like he'll turn into a monster if he so much as touches an unopened box. And now I have to know - did he consult with the neighbors for the lights? Oh my gosh the last conversation is epic-ally hilarious! Oh the crazy things our husbands will say/do. Have a great weekend! tampons to clean a spill... totally!! o.M.G. I am dying! the couch covers and the tampons!! haha... I just want a picture of him with a tampon in his mouth. The fact that he asked for a specific brand of tampons amuses more than everything. LOL the tampon thing. Hilarious mental pic of your hubs w/tampons in his mouth. My house is probably having an identity crisis, because it is AC one day and heat the next. Weather has been insane here. bahahahaha the tampons one was hilarious. tmi, but they are the ones i use because they are the only brand here without applicators (that i can find). did he ask the neighbours about the lights?! What a great laugh for a Friday!! Did he end up going to ask the neighbors about the lights? I seriously got so excited when I saw this post title, hahaha. YES. And it did not disappoint. Your husband is hilarious. Happy Friday indeed! I am reminded of the SATC scene where Steve walks into a door and Blair Underwood shoves a tampon up his nose to stop the bleeding. 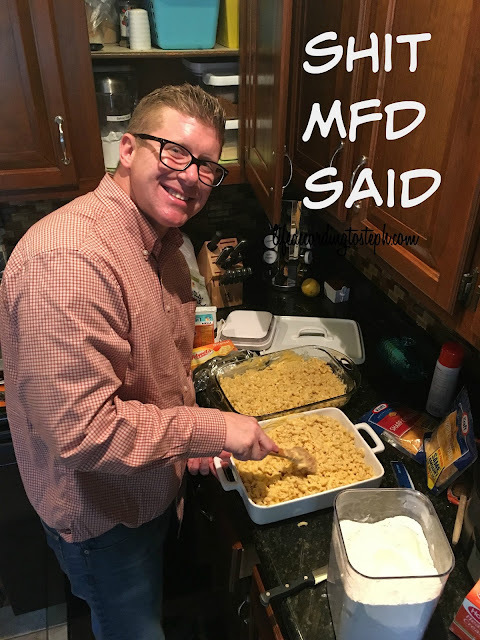 I think MFD has a valid point here. God bless MFD, I love these posts. Did he end up asking the neighbors about the lights?! I so hope he did, that would be amazing! LMFAO at the tampons!! I love these posts! Where'd you two meet by the way? Jesus, the tampons! LOLs for days! I would start writing all of the conversations Pete and I have but, really, how many times can I write about all of Pete's theories on how he'd survive the zombie Apocalypse?? And I should really leave this comment on your other post, but I'll cheat and leave it here: I love painting, I'll come paint your basement! The tampons have to be my favorite . . . and the fact that he was willing to put one in his mouth! LOL! Hahaha I feel like he could have charmed the lights right off of your neighbor's house. Lmao I feel like the tampons thing is something I would do and my husband would make fun of me for. I feel he was being pretty inventive with the tampons in the first place haha. So I'm dying to know what happened with the lights! Did he go?! I love that he wanted to go just to find the perfect lights, did he really go? I can't imagine him putting tampons in his mouth, but I kind of can too. So...did he go find out where they got their lights? Such a cliff hanger! Oh my God, the tampons! LOL!